Transcend TS8GMP710W MP710 White + 8Gb - digital music + FM radio player with G-Sensor step counter + voice recorder, with 2" colour TFT LCD (240x320), built-in MiC + 3.5mm line-in for voice/ audio/ radio recording, 88x44.3x10mm/ 39g, earphone with removable earhook + neck lanyard + detachable sport clip Copyright © 2019 ComXpert International CC - COPYING IS ONLY ALLOWED FOR THE PURPOSE OF SENDING US ENQUIRIES. E&OE. With a G-Sensor step counter, scheduled FM radio recording function, voice recorder, high-quality removable earhook earphones and long battery life, MP710 combines an amazing number of features that give you an enjoyable workout time with music. Aside from the top-notch music quality, the handy fitness mode gives you that extra motivation by presetting and achieving your fitness goals. Depending on your specific goal, MP710's practical fitness mode allows you to preset the total exercise time, number of steps, distance to travel, and the amount of calories you wish to burn in your workout session. The activity tracker will inform you when your goal is achieved, giving an extra sense of accomplishment. MP710 exclusively features a G-Sensor step counter that can accurately count the steps in your workout session. You can preset the amount of exercise before you start, and the handy counter will help you track the progress of your activity. The removable earhook earphones set is designed for dual functions: it gives you a remarkable sound quality for daily commutes or leisure time; its ergonomic design allows the earphones to sit securely and comfortably in the ears for any workout – indulge yourself in music! MP710 features a voice recorder, line-in recording, built-in FM radio, and a scheduled FM radio recording function that can record programs, music or anything you like for up to 35 hours of audio files with 28 hours of battery life. The A-B repeat function serves as an excellent tool for both students and professionals to review important class lectures, business meetings, or even foreign language lessons. Perfect in sound quality, MP710 is also an 8GB USB flash drive with data transfer and storage capabilities to save up to 2,000 songs and countless e-books and text files. Its vivid 2-inch full color TFT screen displays your photos clearly and vividly from any angle, even in bright sunlight. Featuring the Line-in function and a line-in cable, the MP710 enables you to directly record all the audio information to the music player while listening to video turtorials. It performs a best companion to maxmize your study efforts. © 2014 Respective owners and brand holders. This table has been carefully researched and generated by ComXpert International CC (//www.comx-computers.co.za), however, errors and omissions may occur. Only references to South Africa apply. All products are sourced in South Africa from the official suppliers and the warranty is that of the local supplier. E&OE. This table and our site's content may be used on condition that this notice and link remains intact and unaltered. Note *Max. playback time achieved with "screen saver" enabled and "Lyrics Sync" disabled. , ©2014 ComXpert International CC Copyright © 2019 ComXpert International CC - COPYING IS ONLY ALLOWED FOR THE PURPOSE OF SENDING US ENQUIRIES. E&OE. The best price and guaranteed service and backup from official computer suppliers in South Africa for the MP-T710W Transcend MP710 8GB White Fitness MP3 Player. 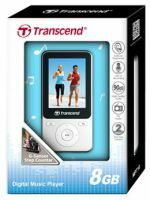 The Transcend MP-T710W Transcend MP710 8GB White Fitness MP3 Player is available for R944. The product is sold by ComX Computers as new. Prices are valid today 2019-04-22 (before 2019-04-23 , by quote, while stocks last). The product is expected to be in stock, although this is not guaranteed. Find related MP-T710W Transcend MP710 8GB White Fitness MP3 Player products in our MP3 WMA audio players Category for even more options. Read reviews and find out about MP-T710W Transcend MP710 8GB White Fitness MP3 Player. Discounts, specials and cheap prices only at ComX Computers.